Swan Hill House is a Victorian house in the middle of East Devon village of Colyford, which has been run by us, Simon and Libby, over the past eleven years. Being centrally located between Sidmouth and Lyme Regis, exploring the Jurassic Coast with the seaside towns of Seaton, Beer and Branscombe and Lyme Regis just a few minutes away, is a doddle. The market town of Axminster is 5 miles away and easily reachable if having a meal at the River Cottage canteen or visiting River Cottage HQ. There is a welcome cuppa and slice of home-made cake for you on arrival, taken either in the guest sitting room or in the garden. You can choose one of our six bedrooms to stay in, which are all en-suite with showers, comfortable beds with good quality linens and goose down duvets. In each room, we provide Pure Blue mineral water, fresh milk, home-made biscuits, apple juice and lovely toiletries. What’s more, the next morning we hope to spoil you with our west country breakfast, all cooked fresh and to order. Our B&B is for adults and children over 12 yrs of age and, as we have two dogs of our own, is not suitable for pets (please don’t worry if you are not ‘dog’ people, we keep Olive and Fizz out of the way unless you wish to meet them). 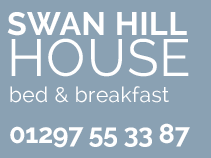 Swan Hill House is open all year, except January, and is ideal for group bookings. Take a look at our rooms and contact us if you wish to chat about what we can offer. For your information, we have a shared drive to the side of the house which leads into a large car park. We hope to make your stay a special one.